Most definitely one of our best selling biking routes, our Connemara Family Adventure tour is acclaimed for it’s off the beaten track routes, spectacular cycling, multi activity options, terrific array of accommodations and unique beauty. 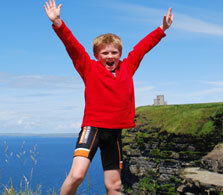 We have adapted this programme and combine it with all of the ingredients for a superb family vacation. Guided Family Tour, 6 days / 5 nights, from €1395 per person sharing. Children's rates available. Our West Coast Family Adventure offers you a family bike trip through the spectacular vistas of Galway Bay, the historical Burren, the Aran Islands and scenic Connemara. Immerse in the history, the culture and the pure magic of the West of Ireland. 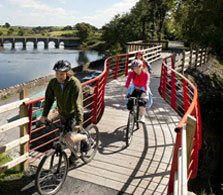 Guided Family Bike Tour, 6 days / 5 nights, from €1295 per person sharing. Children's rates available.